Workplace"Workplace" describes the Autotask Workplace service in its entirety. 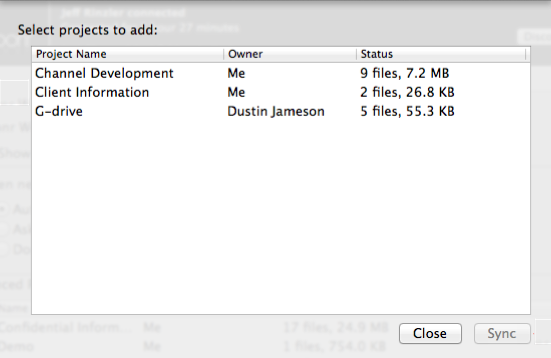 allows you to specify which projects are synced to your device(s). Syncing and unsyncing can be performed through either Workplace OnlineWorkplace Online is the web portal that users within a team can use to access their data and administer their team. or Workplace DesktopAlso known as the Workplace Desktop app, and in the context of this documentation, simply "the app," Workplace Desktop is the software installed on a computer that is responsible for synchronizing data between the local drive and the cloud.. If you wish to sync only certain folder within a project in order to save local storage space, refer to Selective Sync. If you wish to sync or unsync from your Workplace Online, refer to Sync and Unsync Projects. You will not be able to customize projects to sync if the Project list controlled by administrator check box on this page is selected. This means that your administrator has enabled the Projects to Sync security policy for you. If this policy is enabled and you wish to customize your projects to sync, simply clear this option. For more information, refer to Select Policies. Click the icon in the taskbar. 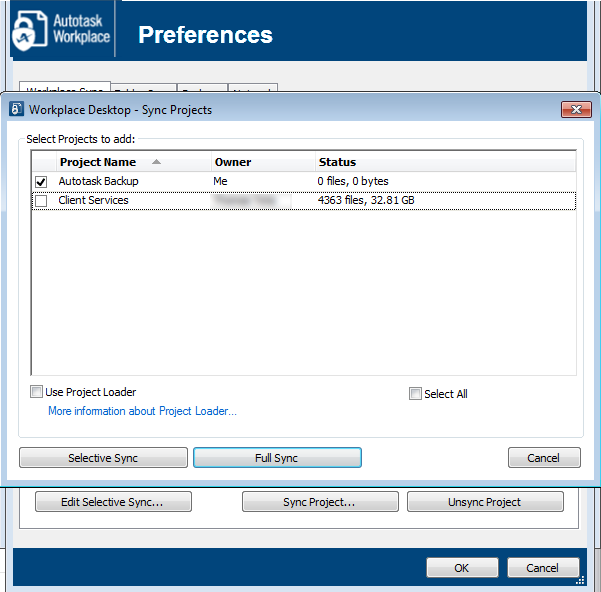 Click Sync ProjectA project is a top-level folder within Autotask Workplace. A project is the primary container for all the folders and files that are synchronized by the Workplace service. Projects create the basic organizational structure to store data and control user access.… to view the projects which are not currently synced. 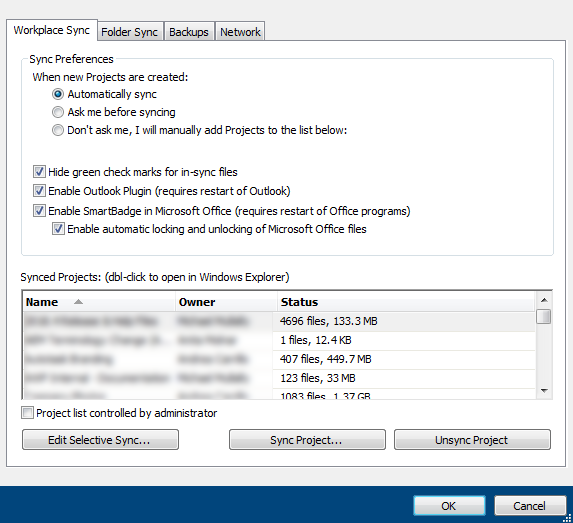 If you have chosen Selective Sync, you will have the opportunity to choose which folders in the project you wish to sync. For more information, please refer to Selective Sync. Click the icon in the menu bar. 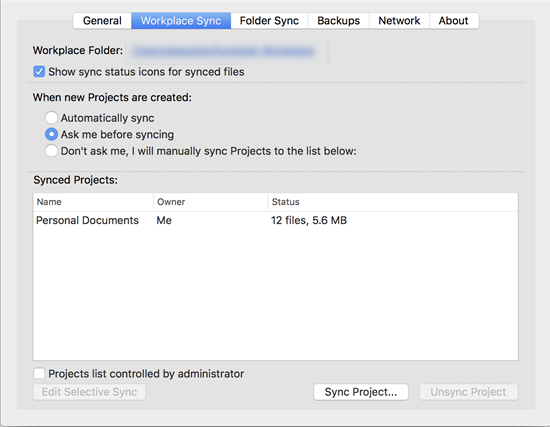 If you have chosen Selective Sync, you will have the opportunity to choose which folders in the project you wish to sync. Click OK after you have selected the folders you wish to sync. For more information, please refer to Selective Sync. Go to Preferences... > Preferences button > Workplace Sync tab. To unsubscribe from a project, select the project and click Unsync Projects. Select the project to be unsynced.